S ometimes a classic story takes on a different form. In the case of "Warm Bodies" that story may be familiar, however, in the case of life in a post-apocalyptic nightmare of zombie hoards, which form comes in the form of a wishful dream. A fun, shambling foray into the romantic comedy genre with a side of horror, "Warm Bodies" stars Nicholas Hoult ("X-Men: First Class," "Clash of the Titans," "A Single Man") and Teresa Palmer ("I Am Number Four," "The Sorcerer's Apprentice") as a cute mismatched couple on a journey of discovery. "Warm Bodies" is rated PG-13 for some of the violence. It doesn't take long to realize that you are watching the most recent adaptation of Shakespeare's adaptation of the 1562 Arthur Brooke's Italian tragedy "The Tragical History of Romeus and Juliet." An older version of the story comes from Ovid's "Metamorphoses," called "Pyramus and Thisbe." Our story's protagonist, is named 'R' because he can't remember his real name, other than it may have started with an 'R.' He spends his days shuffling around an airport terminal. R, unlike other zombies tends to be introspective wonders why he doesn't seem to be like any 'normal' zombies. Why he has flashes of thoughts, almost memories, while he ponders the mysteries of life, somewhat odd for a zombie, don't you think? R is a hoarder, a collector, and he appreciates music. 'Warm Bodies' is based on Isaac Marion's book of the same name and explores the world of zombies as more of a metaphor of the dull grind of everyday life that we find ourselves trapped in. A world where we, as humans, live day to day without any real friends, any real thought of what is happening around us. However, occasionally that one special person appears in our lives and things change. Enter Julie (Teresa Palmer). Julie lives with her father, Grigio, played by John Malkovich. Grigio is the leader of a walled fortress near the center of town. Malkovich plays the father and leader as sort of a gray character, not sure, where he stands in this film other than a minor antagonist. Julie and her boyfriend, Perry (Dave Franco - James’s younger brother), along with a small group of armed scavengers are raiding a pharmacy for medical supplies when R and his group of shamblers smell human flesh and attack the pharmacy. During the melee of humans against the shambling corpses most of the group is killed except for Julie, her friend, Nora (Analeigh Tipton), and of course Perry. At this point, I have to mention that "Warm Bodies" main flaw is a lot of exposition, rather than action. For the first 20 minutes of the film is almost total voice over by R. I guess, that can't be helped, because eh, R is dead. Throughout the film, R interjects humor as we hear his thoughts like when he is munching on Perry's corpse he takes a moment to think about how nice Perry's gold watch is. Or when R and his zombie 'friend,' M (Rob Corddry - 'Hot Tub Time Machine,' 'What Happens in Vegas') try to have a conversation that consists mostly of grunts and groans while the two try to express their feelings for each other. Another road bump that 'Warm Bodies' runs into is that in some cases the pacing is a bit slow. Either because director/screenplay writer, Jonathan Levine (50/50), and editor Nancy Richardson ("Twilight," "The Vow," "Red Riding Hood") were trying to take their time to develop the character of R and Julie, as people (zombie) meant to be together, or perhaps, zombies just don't move that fast. Like the Shakespearian story, R and Julie come to terms with their differences and although he is dead, R does his best to come off slick in front of Julie despite his handicap. The audience witnesses what we as young adults in love go through. It is about half way through the second act that the pacing picks up. What I liked about this film is the sense of hope that the film gives the audience in its schmaltzy kind of way. 'Warm Bodies' also brings to mind another concept that I like is that in the acceptance of diverse states of being or just differences in people. What I didn't care too much for was the amount of exposition along with the concepts that by eating someone’s brains you get their memories. I thought that this one concept I thought was just too farfetched. In this case, R's feelings for Julie are not only due to a physical attraction for her, but mostly by the fact that he ate her boyfriend's brains. 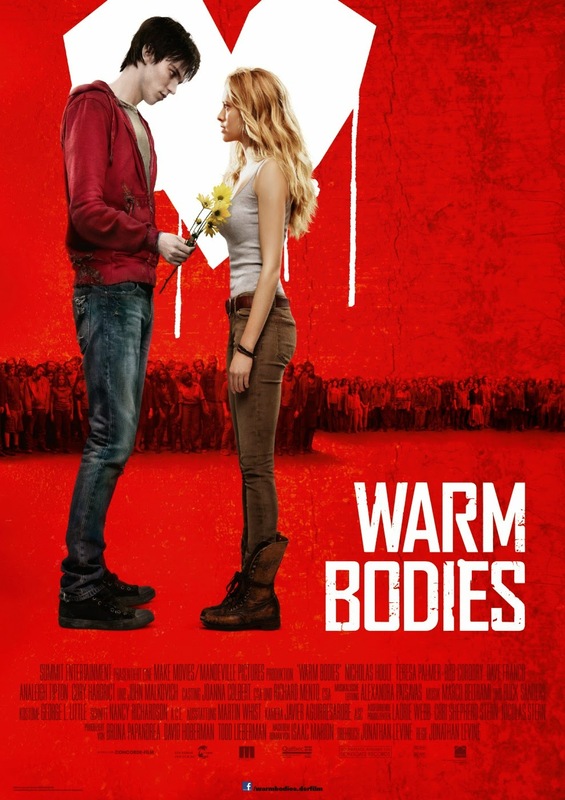 In spite of my minor objections, 'Warm Bodies' is just a fun film to take your older kids to, or a great date movie.